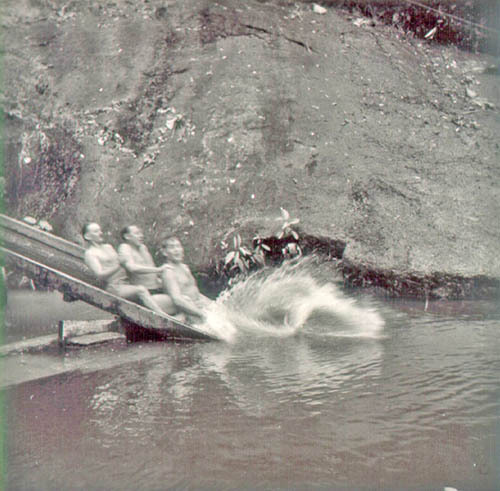 This picture shows three “young at heart” Europeans enjoying the slide into the top pool of three that made up the Taiping Club’s swimming pool in the 1950s. It is still there but sadly overgrown and in a serious state of disrepair. Of course the club now has a new pool. Does anyone out there have more memories of this unique recreational facility? More information about the pool may be found on our database. The Ipoh Railway Station – late 1800s! I visited this place a few years ago. What a wonderful setting for a swimming pool – making the most of natures gifts of jungle and cold running water. What a pity it was abandoned. Hello, lovely to see an image of the old pool at Taiping. I, and twin brother,learned to swim there in 1948 when we were six. We loved the slide (it was wood then). I remember it being a lovely natural area with a waterfall close by serving the slide.I have a photo of the occasion. Memories !! Vince, thanks for the memory and for sharing it with us. As you have a photo would you consider sharing it with us please. A good scan (at say 600dpi or thereabouts) would be very welcome and would join the one above on our history archive (the database) for use in education. The scan can be sent to info@ipohworld.org. Thank you. I remember well this pool as we used to swim there most weekends (1952-55). I particularly remember the wood slide in the top pool with a little hole near the bottom which once tore my swimming trunks! My brothers and I learned to swim there. However the most memorable memory was of the delicious curry puffs, one could buy, served out of an old round biscuit tin. Memories! Thanks for the reflections on life at the jungle pool. With my brothers back in 1961 we loved swimming in the cool fresh water, sliding down the waterfall and venturing in the dark water of the deep pool. After 52yrs on a return to Taping trip could not find the pool which I gather has returned to the jungle. Glad you enjoyed it Ron. Do you have any photos from those days? Terry, Is your brother called Bill? Walter, welcome to ipohWorld and thank you for your memories. We have not heard about the slide attachment and swing before. These will greatly enhance our database entry on thr jungle pool. We look forward to more happy memories. Hi Jill, I too was an army brat in Taiping 1958-1961. I lived with my parents in married quarters just a 10 minute bike ride from the jungle pools, where I was taught to swim in the middle pool. Once I had the confidence I’d dive to retrieve coins from the bottom of the main pool, thrown in (the coins, not me) by sunbathers around the pool. I took the 11+ at the British Army Childrens’ School in Taiping then boarded at Alexandra Grammar School in Singapore. Were you at BACS too? 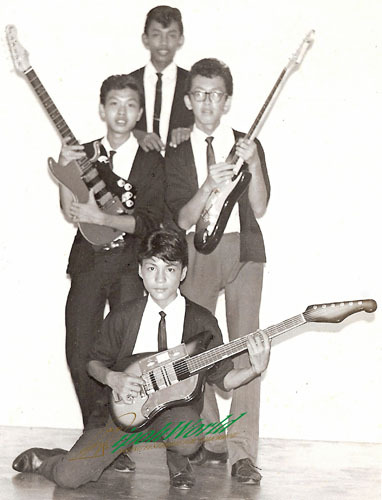 I lived in Taiping from 1963 to 1968 as my father was seconded to the Malaysian Army (Worksop Kedua RMEME). We lived in Sangro Circle and went to BAC School. Mr Holloey was the principal. Went to Bourne School in KL then St Johns in Singapore. The person on the left of the photo (back of the train) is my father, Major Gordon Wilson, RAMC. 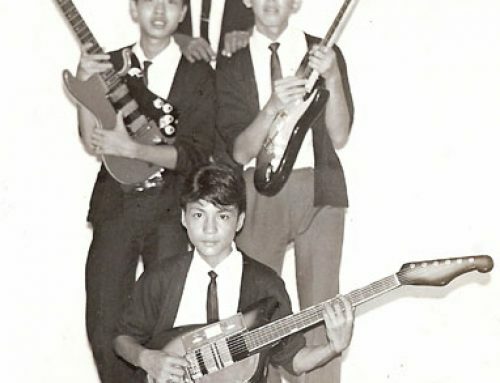 The photo will have been taken during his first tour in Malaya c. 1953-56. We returned to Taiping as a family in 1963 for his second tour, and I well remember our trips to the jungle swimming pool. The wooden slide, by then, was in a state of disrepair but my father had told me about it. Hello Ian, welcome to the blog! Can you tell me please did the big pool have a plank that crossed it.I was 9 at the time so it’s a bit foggy. Yes it did! It was covered in hessian, or similar, and was very bouncy. Great for making splashes. That’s a great point, sk. The Netherlands — a small country — is doing even better, as are Slovenia, Portugal, and Spain. Whereas larger economies — China, Russia, India, Japan, and the USA — are not doing well at all in comparison. I guess the level of education alone does not explain these variations.